Who misses The Great British Bake Off already? Well now you can experience it for yourselves by competing against others in the UK’s first pop-up bake off based in London. 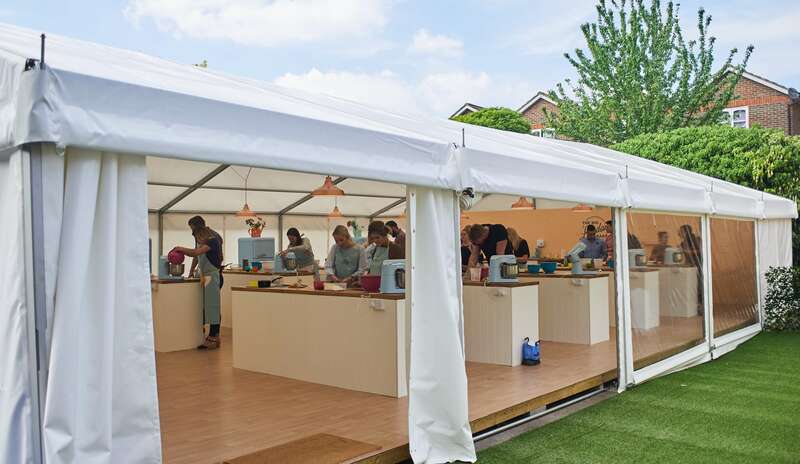 The Big London Bake is essentially the same thing as the widely loved GBBO TV show, complete with ten immaculate baking stations, colourful bunting and high stress levels. Each month sees a new theme and April was all about the throwback biscuits. Think custard creams, chocolate bourbons and jammy dodgers. The venue is situated in the beautiful rear garden of the Castle Pub in Tooting Broadway and what a day it was for it as well, the sun finally came out to play! In fact it was beaming down at us a bit too much if you ask me. Thankfully we were in a marquee so if we couldn’t stand the heat (in both senses), nipping out to cool down was easy – not that there was any time to do so. 90 minutes is all we had to create our winning bakes; the requirements were to make three different types of biscuits. THREE. One iced, one chocolate-covered and one sandwiched. Luckily we were in a team of three so we could tackle one biscuit type each. And with that it was on your marks, get set, BAKE! The marquee was fully kitted out so all the equipment and ingredients were provided and we were given some lovely vague instructions too, enough to make your basic biscuit recipe but the rest was up to us. Hello Google, my old friend. We decided to stick to the classics and attempt party rings, jammy dodgers and chocolate covered digestives with some added pizazz (white chocolate dipped and honeycomb pieces because why not?) The adrenaline kicks in and within minutes our counter is a mess, we’re elbowing each other out of the way and there’s more flour on ourselves than in our dough – off to great start! Mary Berry and Paul Hollywood may not be there but the judge was equally as intimidating, she paces around the tent with a steely glare and perpetual frown. Thankfully there was a friendly team of professional bakers to help us out and give us tips and tricks. It wasn’t long until we were sat on the floor staring at our oven in true bake off style. I decided to make use of the time by scoping out the competition, my not so sly glances saw a few burnt attempts and some soggy bottoms for sure. Looking smug, I headed back to our station to find we too, had our own sodden situation to deal with, uh oh. Perhaps putting them in the fridge will help them firm up we thought, turns out we weren’t the only ones thinking the same thing. Everyone was fighting for space/playing biscuit Jenga in there. This is it, our chance to sabotage. Just kidding, I wouldn’t wish our Howard Middleton’s #CustardGate catastrophe upon anyone! It was times up before we knew it, everyone paraded their questionable creations to the lined up turntables at the front. The judge had a bite from each team’s hard work, taking in account both taste and aesthetics. “I like the look of the overall collection and the homemade jam is nice,” she said. Pretty pleased with that comment, I’ll take that! We thought we had it in the bag. We didn’t. We weren’t even in the top three. The winners were crowned with a star baker spoon and a bakery treat from the head bakers to take home, us on the other hand got to take home our masterpiece (pile of mess) with our heads held high. Never mind! We had an absolute blast and it’s nice to do something a little different. Click here for more information and to book in your own experience.